read Acts 2. 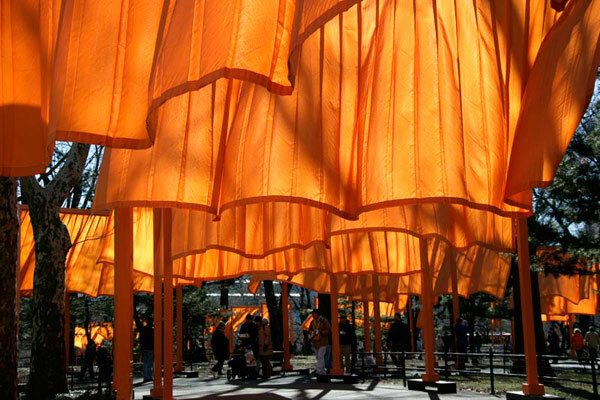 The February morning that volunteers unfurled the orange flags Christo and Jeanne-Claude had planted all over Central Park dawned dull and grey. In that dead winter light, those orange flags looked like, well, orange flags. Most of us who lived in the city thought, “sigh – another dumb $21 million art project we have to live with until the next one comes along.” As the morning wore on, however, the sun emerged. Sighs died on our lips. The sunshine transfigured those ordinary flags into flaming, swirling, banners of joy. It suddenly seemed as if Christo had planted 7,500 beautiful exotic tropical flowers in our communal 840 acre garden. The Gates, as the art project was called, brought tourists and city dwellers together, uniting us as we all wandered around admiring these tongues of fire. As one New York Times writer put it, the gates flickered “like a flame against the barren trees.” NY Times Feb. 13, 2005. When my daughter was born, a nurse I couldn’t even see said, “she has red hair.” I thought the nurse had to be as delusional as I felt at that moment, after giving birth far too quickly for that pain medication I’d been banking on. 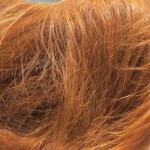 How could my daughter have red hair? I’m blonde, her father is dark. Plus, how many babies even have hair? Plus, did she say I had a daughter? The nurse, it turned out, was right on all count. 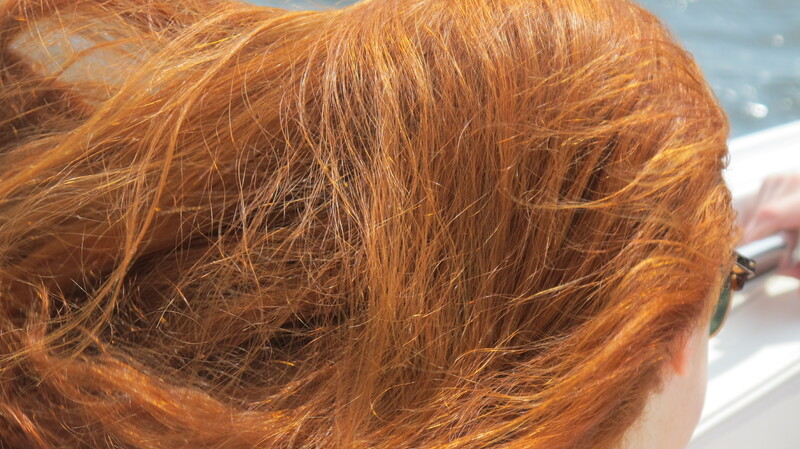 My daughter’s hair really is red. A hair colorist once nearly fainted at the sight of her hair. “oh, oh, oh,” he said, his whole body quivering. “It’s red. And it has blonde highlights.” See left for proof….. Apparently if you dye your hair red, the one thing you can’t do is get the blonde highlights in there. That’s the difference between the fake and the real thing. The real thing glows. It’s the glow, I think, that is the acid test of real beauty. “Princess Mary sighed and glanced into the mirror which stood on her right. It reflected a weak, ungraceful figure and thin face. Her eyes, always sad, now looked with particular hopelessness at her reflection in the glass. ‘She flatters me,’ thought the princess, turning away and continuing to read. But Julie did not flatter her friend, the princess’ eyes – large, deep and luminous (it seemed as if at times there radiated from them shafts of warm light) – were so beautiful that very often in spite of the plainness of her face they gave her an attraction more powerful than that of beauty. But the princess never saw the beautiful expression of her own eyes – the look they had when she was not thinking of herself. As with everyone, her face assumed a forced unnatural expression as soon as she looked in a glass.” War and Peace, Chapter XXV. I read that passage in bed the summer I had mono – perhaps the only way one has time to read War and Peace – and I’ve never forgotten it. I knew Tolstoy was right – we’re most beautiful when we’re not thinking of ourselves. The problem is that it’s hard – if not impossible – to forget about ourselves. Most of us are like Tolstoy’s princess, doomed to assume a “forced unnatural expression” as soon as we look in the mirror. Maybe instead, paradoxically, true beauty comes when we do feel like orange flags on a dull winter day, flat and ordinary. Maybe beauty comes on a day when we look in the mirror and see nothing but a forced unnatural expression. Maybe beauty can only arise on a day when out, of obedience and perhaps desperation alone, we assemble together and wait for a sunshine that comes from outside of us. That’s when, suddenly “a sound from heaven like the roaring of a mighty windstorm” can come. Acts 2:2. It’s when God’s Spirit fills the whole house where we are, just as the scent of perfume once filled the whole house when Mary broke open her jar of perfume to pour on Jesus’ feet. Acts 2:2; John 12:3. When we give the little that we have – even if all that we have is our emptiness – God transforms it into sheer beauty. Flames of fire will appear and settle on us – maybe literally as it did at Pentecost, always in our hearts. And as at Pentecost, God’s Spirit enables us to speak in the languages of other people. That’s because the Spirit first enables us to understand God’s love. Words we’ve heard before, maybe our whole lives, suddenly come through like a tempest. Words like – the Son of God died for your sins – suddenly break open. The words pierce our hearts. God’s language – His love for all, His prearranged plan of salvation through the death of His Son – speaks to us. We repent; we turn to God; we receive forgiveness. And suddenly the world shifts. It’s as if the sun has come out. It’s as if every part of us, every molecule, every hair on our head, glows. It’s as if we become a mirror, not for our own glory, but reflecting God’s glory. His love enables us to become part of a community of people, breaking bread together, in joy. That’s the invitation, the glory and the mystery of God’s beauty. That’s the source of beauty – God, who is Love. Beauty, true beauty, comes from outside, from God pouring His love into us, from God tipping over the waterjars of heaven to fill us with Him, the most beautiful of all. The good news is we need only one thing in order to be filled: we need to feel winter dry, dull, beyond hope – and all of heaven comes down like a mighty tempest to fill us with God’s joy. That’s how we – all of us – any of us – can be transformed into swirling flaming banners of beauty, flickering like a flame against a barren tree. This entry was posted in Acts and tagged bible, Caroline Coleman blog, Christian blog, Christianity, Christo, flames, Jesus, the Gates by Caroline Coleman. Bookmark the permalink.